Featured Image: At the easel, after World War II. 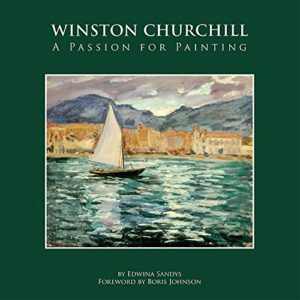 Edwina Sandys, Winston Churchill: A Passion for Painting. Virginia Beach: Donning Company, 2015, 128 pages, $39.95. There are hundreds of books on Churchill as a statesman, but far fewer on Churchill as painter. This one stands out because its accompanying text was written by his granddaughter, Edwina Sandys, herself an artist. In addition to the volume’s impressive collection of paintings, Sandys provides a personal glimpse of her grandfather and his artwork. Sandys’s book asks, and answers, the question: what sort of painter was he? After all, Churchill produced well over 500 paintings during his lifetime, so he certainly had his own insight on the subject. Sandys characterizes her grandfather’s paintings with four elements, which she also applies to his approach to life: bold, irrepressible, loving of life, and inspiring. “People frequently ask me if my grandfather was a good painter,” Sandys explains. “I always answer, emphatically, ‘YES!’ He was good because he painted the things he loved” (24). She relates a story from the memoirs of Churchill’s daughter Sarah, about how he painted “beautiful flaming azaleas” on the “dingy shrubbery” of a gloomily-toned painting on the wall of a villa of Lake Como (18). Though the added azaleas were eventually scrubbed away, the story conveys the undeniable sense of vivaciousness that pervades Churchill’s work. In addition to a fine array of paintings, the book also features an “Abridged Timeline” of Churchill’s life and several pages of well-chosen quotes, which adds to the overall feel of the book. Some of the paintings are accompanied by background historical information—whom he eventually gave them to, for instance, or how certain scenes or landscapes related to Churchill’s life. For example, in the entry for “The Beach at Walmer,” Sandys reveals that the distant figures wading in the surf were actually painted from a photograph of Churchill and his family on the same beach. Seeing the photograph and painting side by side, as well as reading about the historical significance of the beach, lends a new weight to the picture that would have been lost had the painting alone been replicated. As an Art major myself, I enjoyed exploring Churchill’s work. He painted beautiful skies. I have heard before that Churchill loved the work of British painter J.M.W. Turner. I see that delight in Turner sprawling across his most dramatic landscapes. On a final note, the book is well-designed and enjoyable to peruse. It is always disappointing when a book of artwork suffers from a drab cover or poor design. A Passion for Painting is free of such faults. The cover is eye-catching and the text is well-situated among the pictures. The only small critique I can offer is that several of the photographs are grainy, and might have presented better in either a higher resolution or a smaller size. Other than that, however, this book is an intriguing, picturesque collection of Sir Winston Churchill’s art.